The Metropolitan Division-leading Islanders went into their combined All-Star break and bye week losing a 3-2 shootout at Chicago on Tuesday night, knowing they need to play better than they did against the Blackhawks in their playoff push and expecting a majority of their remaining 33 games over the season’s final nine weeks to be the same type of closely contested battles. The Islanders (29-15-5), who have not made the playoffs since 2016, went into the break on a 15-3-1 run. They do not practice again until Jan. 31 and resume their schedule the next day against the NHL-leading Lightning at NYCB Live’s Nassau Coliseum. It’s the start of a grueling schedule in February (14 games in 28 days), March (16 games in 31 days) and April (three games in six days). 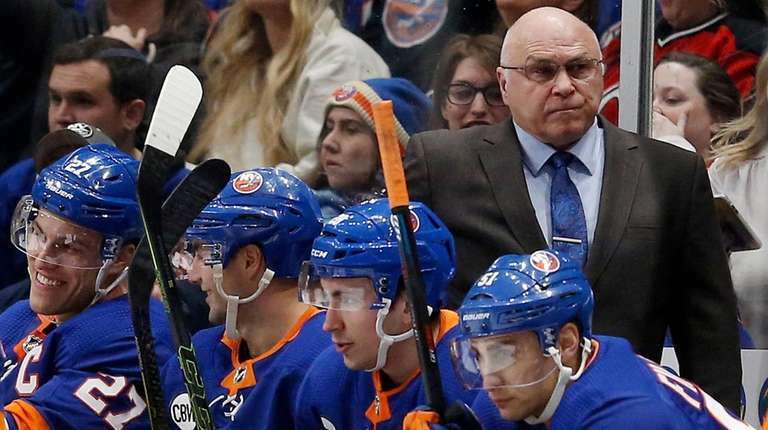 That leaves limited practice time between Feb. 1 and the regular-season finale on April 6 at Washington – “Bet you can count the number of practices on two hands,” Islanders coach Barry Trotz said – as the priority will be on rest and recovery. Which is why the shootout loss to the Blackhawks should serve as a lesson. The Islanders, after holding their previous three opponents to fewer than 20 shots, gave up 40 to the Blackhawks. And instead of limiting shots to the outside and minimizing rebound opportunities, the Blackhawks were able to work the puck toward the crease with regularity, especially in outshooting the Islanders 18-7 in the second period. “Absolutely one of the worst periods in a long time,” Trotz said. Trotz led the Capitals to the Stanley Cup in June before joining the Islanders. Defenseman Johnny Boychuk, who won the Cup with the Bruins in 2011, also is keenly aware of what lies ahead.